Looking for an energy-efficient shop heater at an affordable price? Tannehill Industries, Inc. offers a variety of infrared shop heaters based on portability, efficiency, power and more. 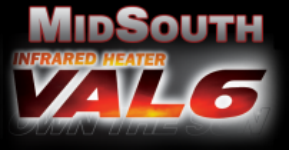 We carry Midsouth VAL6 infrared heaters, as we know these heaters are quality products that customers can count on. We serve clients in Mississippi and surrounding areas, including Arkansas, Louisiana, Tennessee and beyond. Our sales staff would be happy to discuss what product is right for you and your needs. There is a VAL6 infrared heater for almost every purpose. If you need safe, efficient, portable heat for agriculture, industry, or construction, the VAL6 series lineup of infrared heaters has everything you need in a space heater. Whether you're looking for portability, efficiency, power, or all of the above, the VAL6 infrared space heater series has the perfect heater for your workplace. Order your VAL6 Shop Heater Today!